“Wild” is the new movie based on the real-life experiences of Cheryl Strayed. Cheryl lived a hard life. Her alcoholic father abused her mother, Bobbi, until she took Cheryl and her brother and left for good. Bobbi did the best she could raising her two children by herself with little money. She always tried to bring happiness into the home. Bobbi became critically ill with cancer, leaving Cheryl and her brother to fend for themselves. In her grief, Cheryl turned to drugs and a promiscuous lifestyle. Cheryl married a good man, but was unable to commit to the marriage, being unfaithful to her husband. As “Wild” opens, Cheryl has traveled from Minnesota to Southern California to hike the 1,100 mile Pacific Coast Trail as a way to move on with her life. She’s never done anything like this, but needs to start anew. Along the way, Cheryl reads poetry, writes in her journal, loses toenails and gets blisters on her feet. She meets some good people, and some who are not so good. Cheryl is awed by the beauty of nature and wild animals. The hike also takes a toll on her: from the brutal heat to losing her way in the snow, and getting soaked by the pouring rain. Finally, after a touching meeting with a young boy and his grandmother, Cheryl finishes the trail at the aptly named Bridge of Gods in Oregon. “Wild” is a good example of a pilgrimage, a spiritual journey. I’m not sure this is exactly what Cheryl has in mind when she begins, but what journey in life turns out to be exactly as we imagine? On her pilgrimage, Cheryl has the space to reflect on her life in the silence and grandeur of nature. She is finally able to put her life behind her and move on. During her trek, Cheryl often remembers Bobbi with love, and sheds many tears over her loss. She recalls the goodness of her husband. Cheryl also remembers her own wild days. Be advised that these memories are brief, but graphic. 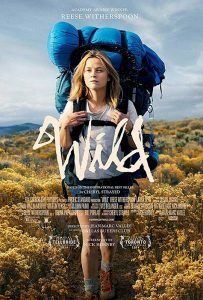 “Wild” is about the redemptive power of life, nature, and community. It’s what many today refer to as “spiritual but not religious.” It would be good if Cheryl had a more explicit religious experience. However the fact that she concludes her journey at the Bridge of Gods can hardly be a coincidence. Reese Witherspoon is great as Cheryl, giving her the courage to go on this journey. Laura Dern is also very good as Bobbi, a woman with a big heart and a courageous spirit. Both have been rightly nominated for Oscars for their performances. I found “Wild” engrossing and satisfying. It’s good preparation for the pilgrimages we will take in our lives.